Cobras are some of the most iconic snakes in the world, instantly recognizable by their hoods even to those who have never seen one. They are also among the most dangerous snakes—fast-moving, with potent neurotoxic venom, cobra bites cause injury or death to many people in Asia and Africa. Cobras are elapids, together with coralsnakes, mambas, kraits, seasnakes, and numerous terrestrial Australian snakes both well-known and obscure. What unites these ~350 species of snakes is their short, immovable, and hollow ("proteroglyphous") fangs. Elapids probably evolved in Asia between 25 and 30 million years ago. By 16 million years ago, cobras were found in Europe, where they no longer live, and in Asia and Africa, where they are still found today. The core cobra clade consists of three small genera (Hemachatus, Aspidelaps, and Walterinnesia) and one large one, Naja. Other hooded snakes that are usually called "cobras" include tree cobras (genus Pseudohaje), whose placement remains uncertain, and the king cobra (Ophiophagus hannah), which is probably more closely related to mambas than it is to true cobras. 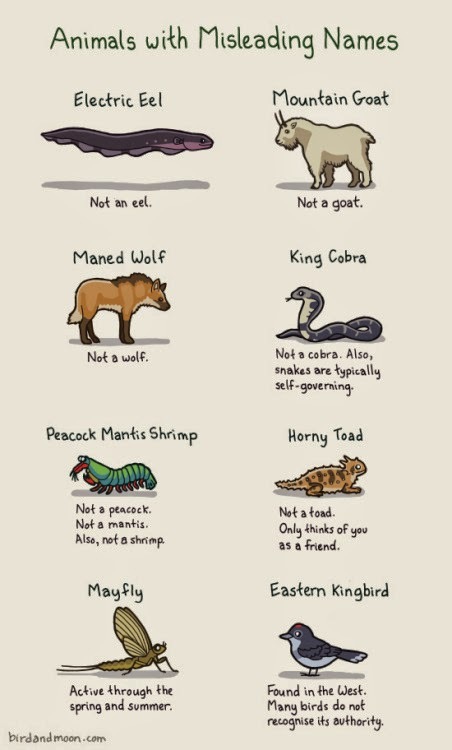 Ironically, most people, if asked for a species of cobra, would almost certainly come up with the king first. But, probably they would think of a spitting cobra second, and with good reason from an evolutionary perspective, as we shall see. Almost all spitting cobras belong to the genus Naja, a large genus that comes from the Sanskrit word for snake, nāga. Literature buffs will recognize the name of the cobras in Kipling's Rikki Tikki Tavi, which led to the name of the snake Nagini in the Harry Potter books. Over the past 50 years, the number of species within the genus Naja has risen from six to 292, and more will probably become recognized in the future. At least 15 of these species can spit their venom through the air. The best of them are capable of aiming at targets the size of a human face with >90% accuracy up to 8 feet away. This adaptation represents the only purely defensive use of venom by any snake. Vipers and other venomous snakes occasionally eject venom from their fangs into the air, particularly when being handled, but these snakes are not aiming at anything, so they are not really using their venom defensively. 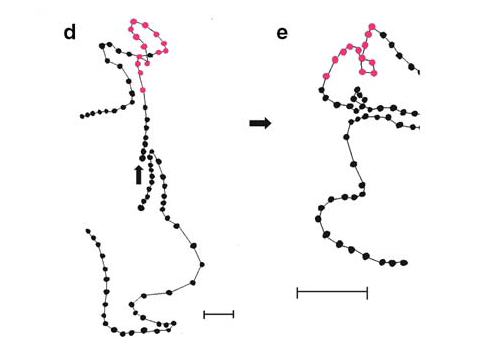 Spitting in cobras is an adaptation that involves changes to the morphology of the fangs, their head musculature, and the chemistry of their venom. Fangs of cobras progressively adapted for spitting. 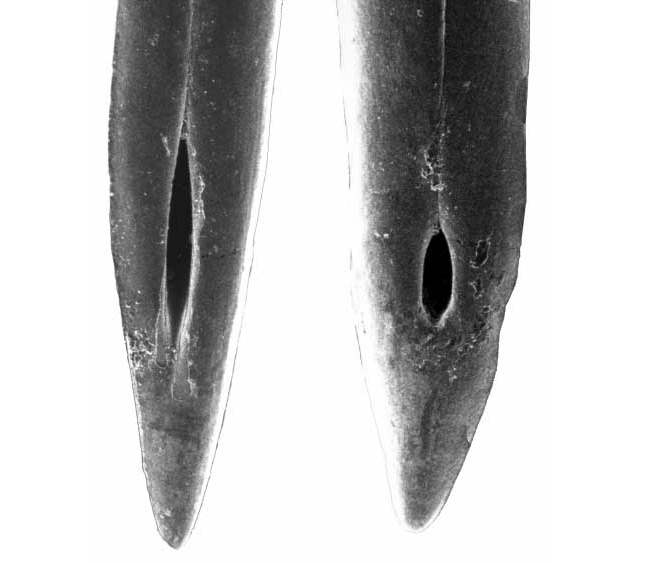 the flow of water injected into the top of the fang. The sutures are visible above the exit orifices. All snake fangs are modified teeth provisioned with grooves that vary in depth and degree of closure. In vipers and elapids, the grooves are completely closed, forming hollow tubes, along the front edge of which a narrow suture can still be seen where the ridges forming the tube have come together in the developing embryo. In spitting cobras, the inside of this tube contains ridges, which act like rifling in a gun barrel to impart spin on the venom. The discharge orifice, located near but not at the point of the tooth (like a hypodermic needle), is large and elliptical in non-spitting cobras but small and round in spitting cobras, which has the same velocity-increasing effect as putting your thumb most of the way over the end of a garden hose. A sharp 90° bend at the distal end directs the jet of venom forward or slightly upward, instead of downward as in most snakes, and venom stream spins towards the exit orifice, which prevents the flow from slowing down as it goes through the sharp bend at the exit (similar strategies are used in pressure washers). These adaptations of the fang enable a cobra to spit venom in defense but do not prevent venom injection when biting, which is used both defensively and for killing prey. In fact, spitting cobras can meter the duration of their venom pulse, which is normally about five times longer during biting (1/4th of a second) than during spitting (1/20th of a second). This affects the quantity of venom ejected, which varies considerably from bite to bite and may consist of up to 100 times more venom than the fairly consistent 1.9-3.7 milligrams (~1/10th of a milliliter) of venom per spit. Most estimates suggest that a single cobra has enough venom to spit about 40-50 times consecutively. The fluid dynamics of such tiny volumes over relatively long distances are complex, and spitting cobra venom has shear-reducing properties, such as high surface tension and viscosity, which hold the droplets together as they fly through the air. 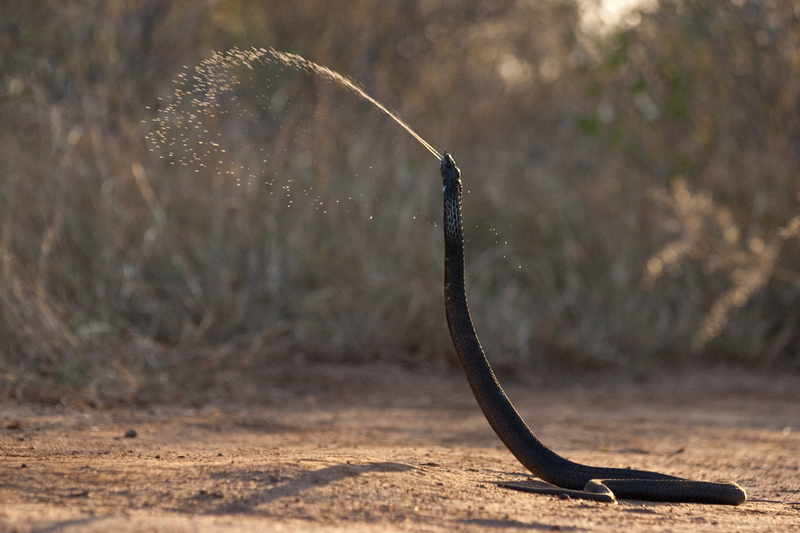 Some species of spitting cobra eject their venom as a spray, whereas others eject two pressurized parallel streams. Reports of the maximum distance achievable by a spitting cobra vary from surely exaggerated distances of 12 feet or more to more believable (though still impressive) distances of five to eight feet. and cobra’s head (red; front plot) motion during spitting. Data are offset 180 ms to reflect the cobra's reaction time. Unlike vipers, cobras cannot move their fangs, so in order to accurately hit their targets, they move their heads instead. When a spitting cobra spits, it opens its mouth slightly and contracts the muscles around the venom glands so that a small amount of venom is forced out of the glands and down the venom canal of the fangs. At the same time, the upper lip scales and the fang sheaths are levered up out of the way and the maxilla levered down, removing soft tissue barriers between the venom glands and the fangs as well as between the exit orifices of the fangs and the air around them3. Most often, the spit is accompanied by slight movements of the head in response to change in direction of the target, which disperse the venom over an area about the size of a human face. 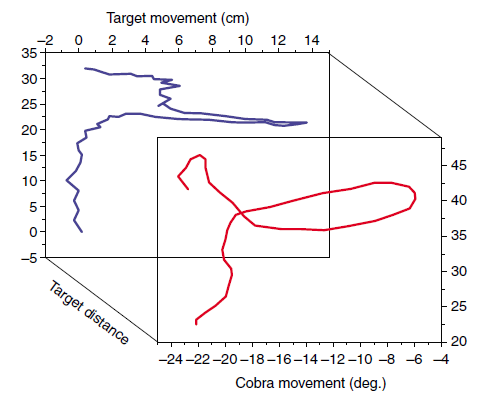 Measurements indicate that more head rotation corresponds to a larger area covered by the venom stream, allowing cobras to adjust for target size and distance. Splattering of the venom when it hits the target and partial disintegration of the venom stream as it travels through the air increase the chance that at least some of the venom will hit the target's eye. Consequently, cobras only need to aim at the center of the face, rather than precisely at the eyes, in order to hit the eyes 90-100% of the time. They adjust for target movement by using a strategy familiar to any Space Invaders or Galaga player: firing not at where you are but at where you're going to be. Chameleons, archer fish and spitting spiders do the same kind of thing. 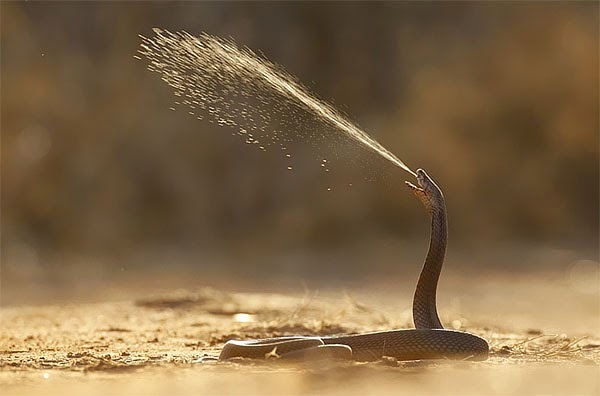 In some species venom spitting is often accompanied by an audible hiss as the cobra exhales, but in contrast to early reports that spitting cobras propelled their venom with their breath, this is not an essential part of the spitting process. In one experiment, spitting cobras restrained in tubes did not seem to suffer from reduced spitting ability or range. How do they choose their targets? Cobras have good vision and moving human faces are the stimuli that normally elicit spitting, although in lab experiments they will also spit at masks, photos of human faces, and even plain ovals without eyes, as long as they are moving, but not at moving triangles. Adult cobras will not spit at stationary human faces or moving human hands, although newly hatched cobras will spit at nearly anything, even if it is beyond their maximum target distance, including human hands, unhatched eggs, other baby cobras, and even their own reflection. Hatchling cobras also spit more of their venom, proportionally, and rotate their heads in a more pronounced fashion; their spitting performance improves following their first shed. Like many stereotypical snake defensive behaviors, most spitting cobras apparently habituate to humans when in captivity and are disinclined to spit after a while, although some spit without hesitation and willingness to express defensive behavior is very variable from individual to individual. Although the color and consistency of spat venom does not change noticeably with repeated spitting, the venom chemistry of at least one species, Red Spitting Cobras (Naja pallida), changed over 10 minutes of repeated spitting. The quantity of venom remained the same and the toxin concentration rose over the first 20 spits, but both decreased afterward. The first five spits contained a protein that was not found in later spits, which might be involved in venom storage. 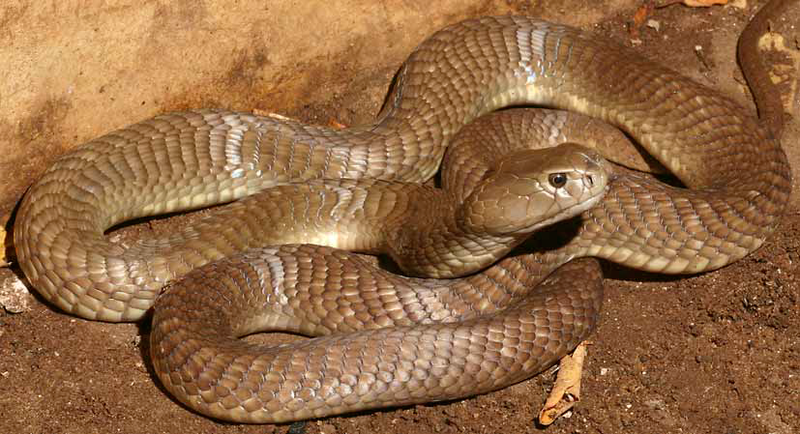 Although this protein is non-toxic, most of the other molecules in spitting cobra venom are not. African spitting cobra venom is rich in cytotoxins and PLA2s, which cause tissue damage; spitting cobra cytotoxins lack certain acidic proteins, which frees them to damage tissues in the eyes. If even a small quantity of venom contacts the eye it causes instant, intense pain and damage to the cornea and mucous membranes. If left untreated, it can lead to blindness. Treating spitting cobra venom in your eyes involves flushing it out with water for 15-20 minutes. Anti-inflammatory eye drops are sometimes prescribed. 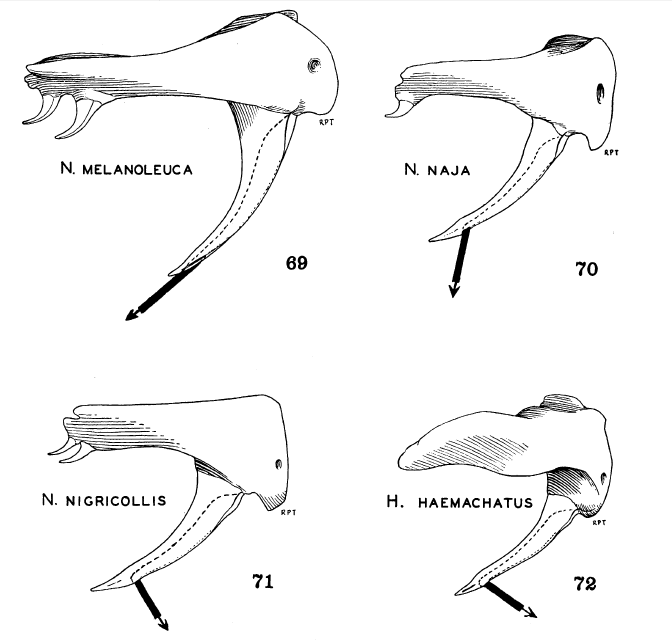 The 29 living species of Naja fall into four groups: a basal Asian clade of eleven species (subgenus Naja, including six accomplished spitting members, two non-spitters, and three species of intermediate spitting ability), an African spitting group of eight species (subgenus Afronaja), and two African non-spitting groups of six and four species, respectively (subgenus Uraeus, found mostly in open areas, and subgenus Boulengerina, found mostly in forests). 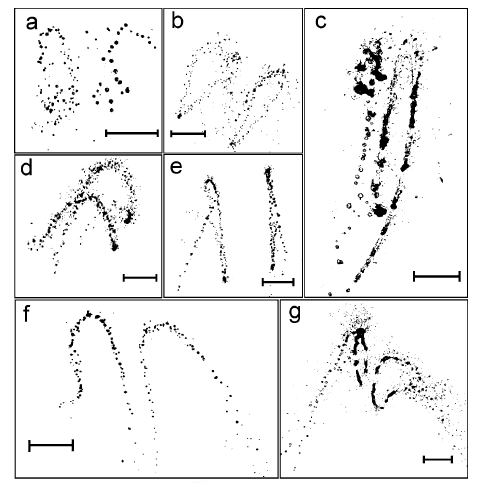 This pattern of species relationships suggests that spitting evolved more than once! 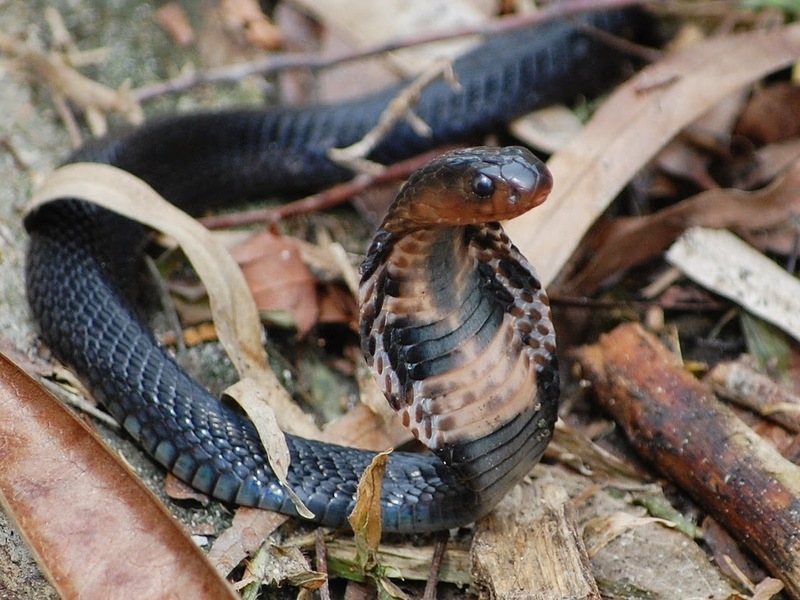 In Asia, the six spitting cobras (Naja siamensis, N. sumatrana, N. sputatrix, N. mandalayensis, N. samarensis, and N. philippinensis4) are probably one another's closest relatives, and their closest cousins are a group of three cobra species (Naja atra, N. kaouthia, and N. sagittifera) with somewhat modified fangs and intermediate spitting ability. They can spit their venom, but they do so rarely and with less accuracy than the "true" spitters. The remaining Asian cobras, Naja naja and Naja oxiana, do not spit their venom but nevertheless are more closely related to Asian spitting cobras than to other cobras. This means that venom spitting arose independently in the common ancestor of the seven species of African spitting cobras (N. pallida, N. nubiae, N. katiensis, N. nigricollis, N. ashei, N. mossambica, and N. nigricincta), which form a monophyletic group sometimes referred to as Afronaja. Their cousins, the other African Naja (i.e., subgenera Uraeus and Boulengerina), do not spit. Finally, a member of one of those small genera, a very interesting cobra known as the rinkhals (Hemachatus haemachatus) also spits its venom, indicating that venom spitting has evolved three times in cobras (or, alternatively, been lost twice, in Naja naja/N. oxiana and in the common ancestor of Uraeus and Boulengerina, with a third partial loss in N. atra & kin). Because the details of spitting behavior and morphology differ slightly among the three groups of spitting cobras, the former hypothesis is more likely. The largest Giant Spitting Cobras (Naja ashei) can top 9 feet. This species was described in 2007. Why do some cobras spit their venom? Herpetologist Thomas Barbour, who published one of the first studies on spitting cobras, thought that spitting cobras evolved venom spitting for much the same reason that rattlesnakes were thought to have evolved their rattles—to alert large ungulates to their presence and avoid getting stepped on. He was speculating in the absence of any direct evidence when he wrote in 1922 that "The African veldt is the only other region in the world where snakes abound and where hoofed animals grazed in numbers comparable with those of the western American plains. Snakes probably found the heavy antelopes equally dangerous though unwitting foes and many antelopes probably suffered from snake bite. No rattle was evolved, however but some of the common veldt-ranging snakes secured protection in another way. Several common cobras and cobra-allies learned to expel their poison in a fine spray for very considerable distances, and with a fairly shrewd aim at the eye." 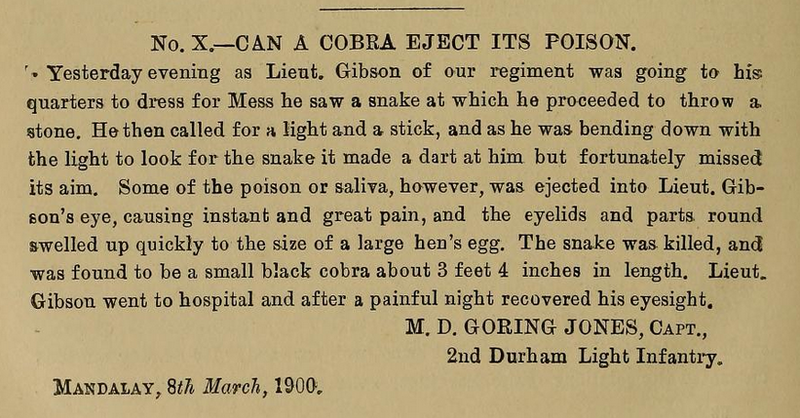 Nearly 100 years after Barbour, we have just as little direct evidence—published field observations of spitting cobras interacting with their non-human predators are non-existent. The main reason we now think that the evolutionary cause of these adaptations isn't so simple is that spitting is too old. Molecular dating methods suggest that African spitting cobras evolved about 15 million years ago, whereas the spread of open grasslands and their characteristic megafauna (elephants, etc.) didn't happen until about 5 million years ago. Asian spitting cobras don't inhabit open grasslands, so this hypothesis seems unlikely to explain their evolution either. 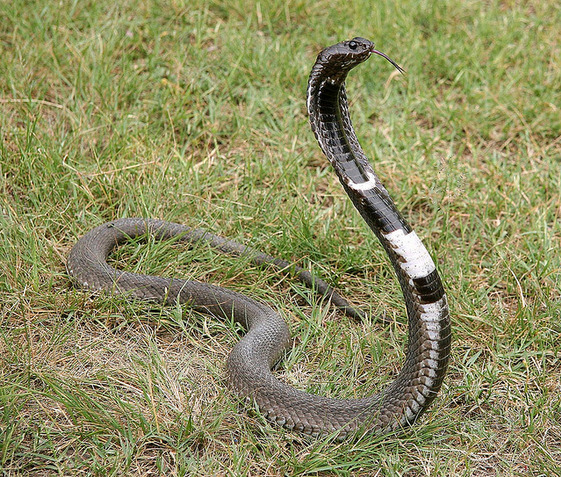 African spitting cobras are eaten by birds and other snakes, against which spitting venom would be a relatively ineffective weapon, and in captive experiments cobras do not spit at mounted bird specimens. Given what we know about face targeting, it's possible that spitting may represent a defense that is specifically adapted for use against primates [Edit: Harry Greene hinted at this idea in his recent book, Tracks and Shadows]. Barbour's comment that "...[venom spitting] must antedate man's coming, for contact between man and the snakes can hardly be conceived as sufficiently frequent to account for the modification" may be technically correct, but the evolution of spitting cobras coincides roughly with the evolution of apes in Asia and Africa, which (as we all know) are diurnal primates with forward-facing eyes, some of which are omnivorous and many of which (ourselves included) habitually kill snakes either for food or in defense. Could it be that spitting cobras evolved their venom spitting capacity to deal with threats from our own ancestors? Only further research into the co-evolution of apes and snakes can tell us. Perhaps this is why, although certain toads, salamanders, insects, and scorpions can also eject their toxin defensively, spitting cobras are by far the longest- and best-known organisms to do so. Clearly, much remains to learn about them and their fascinating habits. 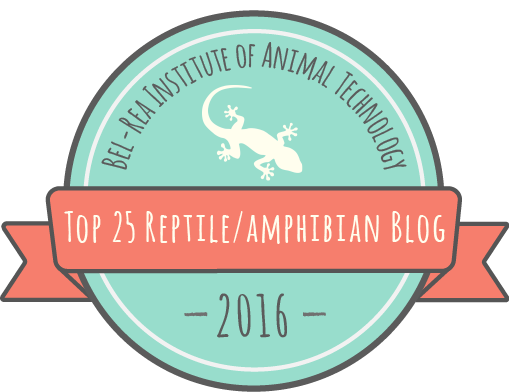 This post is part of a Reptile and Amphibian Blogging Network (RAmBlN) online event called #CrawliesConverge. We are writing about convergent evolution in reptiles and amphibians. Find our event schedule here, or follow on Twitter or Facebook. Thanks to Stu Porter, Dan Rosenberg, and Ray Hamilton for allowing me to use their photos.